A new craft coffee bar brand, started by the head of a D.C.-area construction firm, has plans for an aggressive expansion in the region after signing a deal to open a second location. Republik Coffee Bar has signed on at Kettler’s Highgate at The Mile, a mixed-use development at 7915 Jones Branch Drive in McLean. The coffee brand, represented by Neighborhood Retail Group, is aiming for a fast expansion across the D.C. area, opening an estimated five new locations per year, NRG principal Bethany Kazaba Scanlon said. Pera Construction owner Talha Sarac created the brand in Ballston. Sarac had owned a franchise of Rock ‘n’ Joe at 4401 Wilson Blvd. 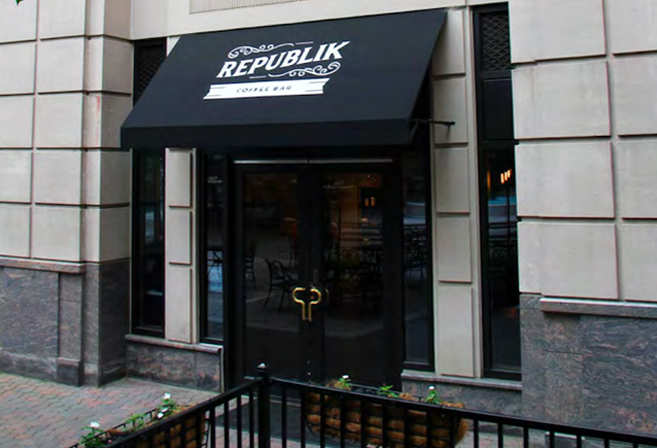 and rebranded the coffee shop to Republik Coffee Bar in May. Sarak is now looking to open Republik in new developments in emerging neighborhoods around D.C with high foot traffic. It is seeking spaces of roughly 1K SF to 2K SF and would prefer outdoor seating. The independent coffee brand, which features nitro cold brew, drip coffee and a host of specialty lattes, aims to compete with other growing craft brands such as Compass Coffee and La Colombe.